Before the entitled enthusiasm of Yolo, there was Memento mori, of essentially the same message, as conveyed by endless still lives centered around the human skull. “Remember that you will die,” in contrast to “you only live once,” is grim not because of death, but that — like children with brushing teeth, or a guy on his anniversary — we must constantly be reminded of it. 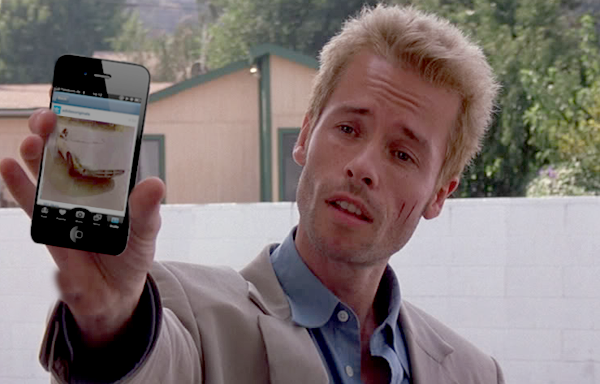 Had the makers of Memento (2000) known about Instagram, its screenplay might have worked differently, with our more efficient protagonist streamlining his way through the narrative. Instagram supplements its photos with immediate nostalgia, as if we — in our frantic only living once — could no longer wait for an event to age naturally. We wanted quick memories of moments which seemed like they deserved to outlast time. On April 12, 2012, Facebook bought Instagram for $1 billion dollars, and later that year, changed its copyright section in the Terms of Service such that any user content could be sold to third parties without notification or compensation. This would not be a problem, as users would be flattered, floored even, to find their trite moments corporately noticed. Call it inverse stock photography. Leonard Shelby (Guy Pierce) suffers from anterograde amnesia, chasing suspect signs and symbols, stuck in the purgatory of self-deception. The inability to produce new memories is far more tragic than the more common retrograde amnesia, in which one loses their past but may produce a new one starting at the point of their affliction. It is, in a way, being born again. In 1972, Polaroid introduced “instant film,” what became subsequently known by the company’s name. The immediacy of a memory, as commemoration of a transient life, may be archaic after all. The polaroid’s faded light and approximate shadows were less of an aesthetic than merely technological constraints at the time. As the inferior image slowly surfaced from the depths of that lush creamy void, the exhilarated holder would compulsively shake the photograph at every moment of its development, as if to summon more memories.